Britain's Tim Henman will face Russian Dmitry Tursunov in the opening round of the US Open - his final Grand Slam event - next week. 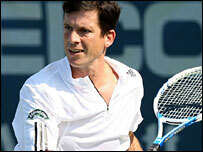 Henman who, as expected, announced his retirement on Thursday, has beaten Tursunov only once in six meetings. Andy Murray, the 19th seed, will open against a qualifier at Flushing Meadows if he overcomes a wrist injury. Defending champion and world number one Roger Federer will also play a qualifier in his first-round match. He could also face a qualifier in round two although things could get considerably more difficult if 6ft 9in American John Isner makes it through to meet the Swiss in round three. Andy Roddick is also in Federer's quarter, while in the bottom half of the draw third seed Novak Djokovic opens against Mario Ancic and second seed Rafael Nadal plays Australian wildcard Alun Jones. In the women's draw, second seed Maria Sharapova begins her title defence against Roberta Vinci. The top half of the draw looks much tougher, with top seed Justine Henin, third seed Jelena Jankovic, in-form Ana Ivanovic and Venus and Serena Williams all vying for the semi-final places. Henman has struggled against the 27th-seeded Tursunov in their previous meetings with his only win coming on the grass at Queens in 2006. Tursunov beat Henman at Wimbledon in 2005 and also at last year's Australian Open and French Open. "It's a tough draw. He hits the ball hard and can hurt you from anywhere on the court," the Briton told his website. "His game is based around his big serve and huge groundstrokes and he can be intimidating to play when he's confident and in the right mood. "He likes playing in America as the conditions suit his game so it's going to be a big challenge for me, no question about it. "I'm going to have to serve well and take my chances. We've played quite a few times so I know what to expect and so does he, so it will pretty much depend on who plays best on the day."